Get expert Ramsey asphalt and pavement drainage services when you call us today at (201) 327-5258. Drainage is one of the more important aspects of the overall health of your pavement, so give us a call and we will set up an appointment to provide you with the solution you need. Click here to see our online sales and coupons. Asphalt is a flexible, versatile material that’s essentially a mixture of aggregates, binders and filler. The aggregates often consist of gravel, sand or crushed rock and the binder is usually bitumen, which is an oil-based substance. When everything is mixed together, asphalt is born and can be used for scores of different applications. One of the more important aspects of keeping your asphalt surface in good condition is drainage. Want to find out what your neighbors are saying about us online? Click here for the reviews! How Does Water Get Into the Pavement? Water comes in many different forms, and while it is essential to maintain human life, it won’t extend the life of your pavement. Too much water will weaken the structure of the asphalt, and if there are any cracks or holes, it will penetrate and weaken it even more. The main way that way gets into pavement is through regular precipitation. The rain will enter the pavement directly, and it can also end up in the pavement from the shoulder of the road or from ditches and other spots where it can accumulate and then move by gravity. What Factors are Important for Asphalt Drainage? When a new road, parking lot or other pavement project is being planned, drainage must be one of the top points of discussion. Some of the important factors when considering the drainage plan, include the expected amount of annual rainfall, the size of the area that requires draining, slope of the surrounding area, elevation of the groundwater table and characteristics of the subgrade soil. If these and other elements aren’t carefully considered and planned for, you may end up with standing water on your surface, causing continuous damage. There are two specific aspects that contractors consider when it comes to pavement drainage: surface drainage and subdrainage. Surface drainage concerns the more immediate issues associated with water accumulating on the surface of the pavement and subdrainage deals with the long-term performance of the pavement. If surface drainage is too slow, there can be issues with icing of roadways when the temperature drops, creating a particularly dangerous situation. 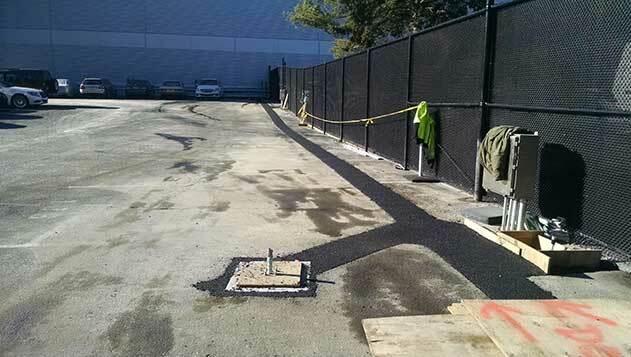 If you are planning a project that requires laying asphalt, don’t leave the drainage element to chance. Call McFarlane Asphalt at (201) 327-5258 in Ramsey, NJ and the surrounding area for fast, expert service you can trust.